Are you traveling with kids and that too to Los Angeles? Well, it sure seems to be a daunting task. No matter where you are traveling with children, it seems like a mission impossible. With children, one just cannot afford to make any mistakes with their plans. There is so much extra packing and planning to do, whether it is the documents their clothes, toys, and more. The planning needs to be executed meticulously, based on the age of the child, who could be a baby, toddler, or an older child. No matter where you go, the idea of traveling with children can be a bit overwhelming. However, there are ways you can turn this seeming mission impossible into a mission possible. All you need to do is indulge in some smart thinking and follow some tips that can help you prepare well for the trip. Your first important step should be to do a research on the city you plan to visit and what your family is looking for in the trip. Keep the age group of the children in mind when researching about places to visit. It is obvious that your older child would not be interested in activities meant for a toddler. So, keep all perspectives in mind when searching, the weather, what to do and see, the costs involved, the food and where to stay. Most importantly, do not ignore what documents you need to carry and what all you need to pack for the trip. Keep your family involved at every step to keep them interested. Once you have researched well and have decided on where you want to stay in L.A., dates to travel and flight you want to book, it is time to make the final reservations. Book your hotel and flight in advance to avail the best offers. Book a room at a child-friendly hotel and look for services like babysitting and room service; and if you get the facility to prepare your own meals, it is even better. After all, children can get fussy about what they like or want to eat. Book wisely and check out the location of the hotel before booking. Keep in mind all that traveling and rushing off the airplane, dealing with flight delays when traveling with kids. Just make sure that you are in charge of the situation and everyone enjoys the trip. Just go through the following tips to feel a lot more confident on your trip to L.A. When you leave for the airport, ensure that there is minimum time spent in waiting. All you need to do is check beforehand if the flight is on time and check-in online. Still, don’t leave home at the last minute and have some time to spare. Make use of the family or play area at the airport in case of unforeseen delays. The idea is to keep your children occupied and relaxed during the trip. Sometimes, plans do get awry despite all that careful planning. Sometimes, your child simply chooses to be stubborn and turns into a screaming beast for no rhyme or reason throwing tantrums. Things can get worse if you lose your cool, so just stay calm, take a deep breath, and handle the situation with a smile. Just remember that you are on a family holiday and going to an exciting city L.A.
Not sure if you are eligible of applying for Visa Waiver Program? Check here the requirements for getting your ESTA Authorization. Do not make the mistake of overpacking – Parents often tend to overpack when traveling with children. Remember that you can easily manage without certain items. Baby carriage, stroller or sling – Whether you would need a baby carriage, stroller or a sling would rely on the age of the child and where you need to go and how comfortable your child needs to be. A light stroller is always a good option, as it is easy to carry. Food and snacks- Although most airports have food outlets, there is no harm in keeping a few snacks and food items that are a favorite with your children. If you are traveling with a baby, then you might need to pack baby food as you can’t take the risk of feeding your baby with any new or unknown brand. Clothing and Sunscreens – As you would be outdoors most of the time, keep your little ones protected against the warm sun and pack a sunscreen that is at least SPF 30 or higher. Pack shorts, tees, and at least one hat to keep them comfortable. It is must to pack bikini or board shorts for the beaches. Make sure that there are flip-flops, flats, and hiking boots for each child. Water bottles and medications – It is a must to carry water bottles that can be refiled, as well as any essential medications that your child might need during the trip. Keep these things handy always. Los Angeles is definitely a great city for family fun, and it is packed with family attractions. There is every kind of fun thing to do here suiting every kind of family and their needs. While some parts of Los Angeles may not be child-friendly, it still boasts of plenty of child-friendly attractions such as interactive museums, theme parks, beaches, aquariums, and more. Explore the Griffith Park Merry-Go-Round that is said to be the ‘happiest place on earth’ for the little ones. Created by Walt Disney, you can watch your little ones enjoying the vintage merry-go-round. Another place you could go to is Southern Railroad where you can enjoy looking at mini forms of vintage locomotives and enjoy joy rides with your kids. Santa Monica Pier is another favorite among the young ones because of the Ferris wheel, aquarium, and merry-go-round. Boomers is a family entertainment centre and fun park where you can enjoy zipping around in Go Karts. Take your children to the Griffith Observatory with the world’s top planetarium and watch them scan the skies through a telescope with excitement. For the children with a scientific bent of mind, California Science Centre with high-tech exhibits on nature and technology is a must visit. If your child is a dinosaur fan, take him to the Natural History Museum to look at the most impressive dinosaur exhibits in the world. At the Zimmer Children’s Museum, your children can fly planes and drive ambulances. Teach them the importance of compassion and enhance their cultural understanding at the interactive educational centre of the Museum of Tolerance. Your children will simply love the Kidspace Children’s Museum with its educational gardens and water features driven by nature. If you are looking for some fun and excitement, take your child to the Magic Mountain, a massive Valley theme park. The Hurricane Harbor and adrenaline-packed roller coasters are the main attractions here. The live shows and studio tours of the Universal Studios Hollywood are a big magnet for the families. Another fun point is a horseback tour through rocky Griffith Par that is simply loved by children of all age groups. Kott’s Berry Farm is a family-friendly theme park that has something fun for everyone. There are both smaller and bigger thrills here and plenty of exciting family rides. 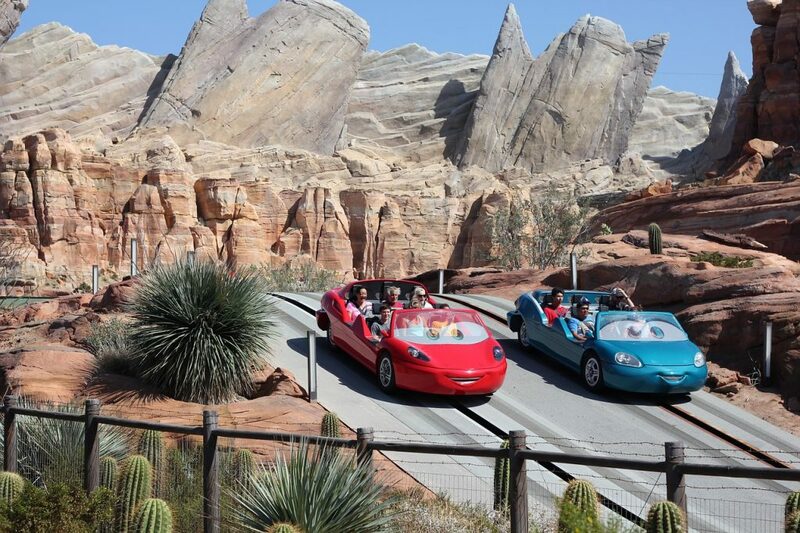 Disney California Adventure is a world-famous amusement park loaded with family-friendly attractions. It is full of themed lands, wonderful rides, and offers entertainment for all age groups. Enjoy those thrill rides, kiddie rides, water rides, parades fireworks, and themed dining and a lot more. Another must-do is to take a tour of the Universal Studios and embark on a fantastic journey into the fictional themed worlds of Harry Potter, Simpsons,’ and much more. L.A. is famous for its golden sandy beaches, and Santa Monica is a big draw for the families. Santa Monica pier is now more than 100 years old, and one can enjoy a great view of the coastline from the top of the pier. Manhattan Beach and Cabrillo Beach with calmer waters are just perfect catch for families traveling with kids. Enjoy harbour cruises and book one of those whale-watching trips with Aquarium of the Pacific. Aquarium of the Pacific in Downtown Long Beach is a popular marine aquarium with 50 exhibits. Watch your children squeal with joy, as they explore the Sea Jellies, Sea Otter Habitat, Shark Lagoon, and Penguin Habitat. Los Angeles beaches offer plenty of activities for families along its coastline. You can see families swimming, castle building, biking, roller skating or simply lazing on those white sandy beaches. Mother’s Beach is a man-made beach, which is simply a perfect beach for the babies. After all that touring and sightseeing, children do get hungry. So, if you don’t have some good options on hand or in mind, they can get cranky within no time. While it is a good idea to carry some snacks wherever you go, make sure that you have some restaurants in mind that have a kid-friendly menu. While, most restaurants serve hot dogs, macaroni and cheese, there are a few that are a big hit with families traveling with children. Children love eating out in a comfort zone and can get a little more adventurous if they are in the mood. Huckleberry Café& Restaurant accommodates kids and serves heart-shaped shortbread cookies, scrambled eggs, peanut butter, homemade strawberry preserves, and turkey and cheddar sandwich. They have a small toy collection and coloring books to keep the children busy. Mendocino Farms serves roasted turkey and cheddar sandwiches, house-made peanut butter, and strawberry jam. It is highly popular among children. Playa Provisions prioritises kid’s menu, and their favorite is a substantial sandwich filled with mild, white fish, and mini-ice cream sundae and the kids’ egg-in-a-hole is an all-time favorite. Sushi Roku – The sushi assortment bento box is a great way to expose kids to sushi. The children love the colorful bento box filled with cucumber rolls, tuna rolls, shrimp, and tamago nigir and fruit. Tavern is known for its Tavern burger and “Jules’ fish and chips with tartar sauce.” Children love another option here i.e. grilled cheese with apples. Wood Ranch Bbq & Grill is known for serving chicken tenders and meaty baby back pork ribs. Their Atlantic salmon grilled over oak and choice of sides like baked beans, mashed sweet potatoes, and steamed broccoli is an all-time favorite. Holidaying in Los Angeles is indeed not a cheap plan to execute out of the blue. However, you need not break your bank balance to enjoy the city or have fun here with your children. There are several exciting options that will not cost you a dime and are completely free! Especially, many places allow free entry to kids. Go ahead and check them out. Travel Town: Explore the outdoor transportation museum filled with real steam locomotives. Watch your children climb around the locomotives and other world-class antique vehicles. La Brea Tar Pits: The admission to the famous La Brea Tar Pits is free on the first Tuesday of the month. There is a plenty to see and explore. Remember to take selfies with the elephants in the fizzing tar pit. Cabrillo Marine Aquarium: Spend some time in the Cabrillo Marine Aquarium. Do not miss out on the simulated “tide pool touch tank” as well the giant whale skeleton that hangs from the ceiling. LACMA: Children are allowed free entry in the world-class museum, and here they can explore the modern art sculptures. Let them create watercolor artworks in the painting studio in the Boone Gallery. Paramount Ranch: Explore the ghost town and let your little ones experience the wild, Wild West in this small western town. Let them pretend to be cowboys and cowgirls, or you can go for some easy hikes to enjoy with your little ones. Tide Pools: There are plenty of tide pools in and around LA here, one can spend a relaxing day with their family. They can explore the beaches or take short hikes across the sandy beaches and enjoy gorgeous views with your family. Thus, travelling L.A. with kids is definitely a mission possible to take on. You can plan the trip and enjoy it to the fullest.